The second round of games in the 1st Noshin Shin Ramen Cup was played in Tokyo from 18 to 22 January 2000. In the first game, played on 18 January, Luo Xihe 7-dan of China, who had beaten Kudo Norio 9-dan of Japan in the last game in the opening round in China, was matched against Kim Yong-sam 4-dan of Korea. Playing black, Kim won this game by resignation. On the next day, Japan fielded its international ace, Yoda Norimoto 9-dan. The latter did not let Japanese fans down, defeating Kim by 11? points (Yoda had black).This game was followed by a rest day, then on the 21st Yoda scored another win, defeating Wang Lei 7-dan of China (Yoda again had black). At this point, Japan had a share of the lead for the first time in this series, matching Korea's three wins (China had just one). However, on the 22nd Yoda met a tough opponent in the person of Cho Hoon-hyun. Cho won this game, so once again Korea took the lead with four wins. The playoff between the winners of the Japanese and Chinese versions of the Agon Kiriyama Cup was held in Beijing on 12 January 2000. Playing white, Kobayashi Koichi of Japan defeated Ma Xiaochun of Japan, forcing him to resignaiton after 238 moves. Kobayashi thus becomes the first unified champion. This tournament usually has a time limit of one hour per player, followed by byo-yomi. However, the Chinese national TV channel made a sudden decision to televise the playoff live and it requested the players to play under the same conditions as the NHK Cup, that is, with a time allowance of ten minutes, to be used at any time, and byo-yomi for each move. Two of Japan's five non-seeded places in the 13th Fujitsu Cup were decided on 17 January. One went to Cho U 6-dan, a 20-year-old Taiwanese-born member of the Tokyo Nihon Ki-in. The other place went to Hikosaka Naoto 9-dan, who will be making his second appearance in the Fujitsu Cup. The pairings in the playoffs for the other three places are interesting. They are: Kobayashi Koichi vs. Takemiya Masaki, Moriyama Naoki vs. Takao Shinji, and O Rissei vs. Michael Redmond. Kobayashi and Takemiya are both former winners of the Cup (Takemiya twice). Whoever wins the second pairing will be making his debut in the cup. Takao Shinji set a new record for Japanese go with 61 wins last year. His opponent, Moriyama, may not be so well known, but he is one of only three Japanese players to score a perfect record (seven wins) on a Japanese tour of China. The last pairing is of greatest interest for overseas fans. Until now, Michael Redmond has always played in the North American qualifying tournament and has won it five times. However, recently he has been finding the trip to America to compete in the qualifying tournament too much of a disruption to his schedule, so he decided to play in the Japanese qualifying tournament. Before he virtually had a 50-50 chance of playing in the Fujitsu Cup, as his results against the other main North American contender, Jimmy Cha, were pretty equal. In the case of Japan, it's incredibly tough to win a place, as you have to win around seven successive games against top-flight competition. Even a player like Yoda, who is Japan's most successful player in international go (and who would probably be seeded unconditionally by other countries), has managed to win places in only two Fujitsu Cups. Michael Redmond has played brilliantly in the qualifying rounds to reach the playoff. However, the last hurdle will be the greatest: O Rissei is a very tough opponent. We can only wish Michael the best of luck. Two games in the Honinbo league were played at the Nihon Ki-in on 20 January. In one, Cho Chikun (white) defeated O Rissei by resignation. In the other, Rin Kaiho bested Otake Hideo, also by resignation. As a result, Otake, with 2-2, dropped out of the joint lead, which is now shared by Cho Chikun and O Meien, both on 3-1. 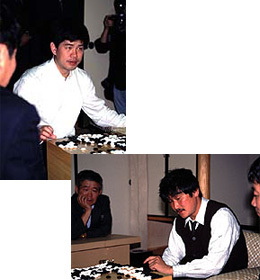 Tied with Otake in third place are Hikosaka Naoto, Yamada Kimio, Rin Kaiho, and Ryu Shikun. With only one point separating them, the seven players mentioned so far are all still in the running to become the challenger to Cho Sonjin. The only person out of contention is O Rissei, who has started in most uncharacteristic fashion with four straight losses. The following is a list of the players who were financially most successful last year. The first game of the 24th Kisei title match was played in Nago City In Okinawa on 12 and 13 January. Playing white, the defending champion, Cho Chikun, defeated O Rissei by 4.5 points and so made a good start to his defence of the Kisei title. The game started uncharacteristically, with Cho building a centre moyo because O had taken all four corners. In the process of erasing Cho's centre, O found his corner territories whittled down. Cho also played some clever moves in the centre fighting. His good play in the opening game shows that O is going to have a tough time trying to take his title from him. Of their time allowances of eight hours each, O had nine minutes left while Cho, as usual, was down to the last minute of byo-yomi. The second game will be played in the town of Shizukuishi in Iwate Prefecture on 26 and 27 January. 23 December 1999) Otake Hideo (W) beat O Rissei by resignation. 6 January) Yamada Kimio (B) beat Hikosaka Naoto by resignation. 13 January) O Meien beat Ryu Shikun. Hane Naoki 7-dan has made a good debut in the Meijin league, defeating O Rissei Oza in his opening game. At present, Yoda is the only player with two wins, but Ryu Shikun and Hane, who both have one win, have not yet played their second-round games. The following is a list of the games from the Meijin league played since our last report. 6 January: O Meien beat Kobayashi Koichi by 2.5 points; Hane Naoki beat O Rissei by resignation; Yoda Norimoto beat Kato Masao by resignation. The final game in the losers's section of the 38th Judan tournament was held on 6 January at the Nihon Ki-in. Playing black, Nakano Hironari 9-dan of the Nagoya branch of the Nihon Ki-in defeated Cho Chikun Kisei by resignation. Nakano therefore gained the right to meet Yamashita Keigo 6-dan in the playoff to decide the challenger to Kobayashi Koichi. Nakano lost to Yamashita in their game in the winners's section, so he will be seeking revenge. Whoever wins the playoff will be making his first title match challenge. Takao Shinji 6-dan has set a new record for most wins in one year: 61. Following him in second place was Yamashita Keigo, whose record of 60 wins, set in 1998, turned out to be surprisingly short-lived. The opponent against whom Takao scored his 61st win was Mizogami Tomochika 6-dan, who before the game had the best winning percentage for the year of 83.3. Because of his loss, he dropped into second place in that category. Below are some statistics for 1999. Just for the record, Cho Chikun's record was 31-21. Michael Redmond 8-dan scored 24-15 (equal 40th). In the under-5-dan group, Catalin Taranu 4-dan took 8th place with 23-13. Kobayashi Izumi was the top woman player 38-22.